The Knowledge Matrix, as a tool, is meant to be investigated and interacted with by users. However, in order to provide an introduction to the Matrix as a whole, we present summary characteristics of some of the main Matrix variables below. Each hypothesis is categorized based on the amount of empirical support available in the open literature. 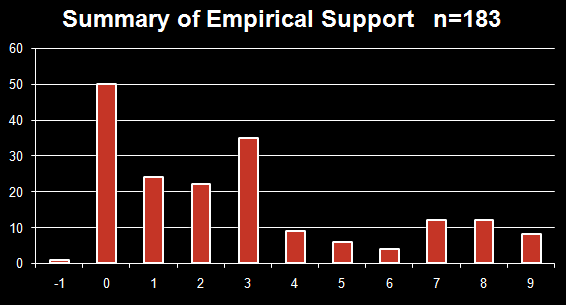 (This scale is available by clicking the question mark next to Empirical Evidence Score in the Knowledge Matrix.) Fifty of the 183 hypotheses did not have any relevant empirical evidence to support or contradict the assertion. 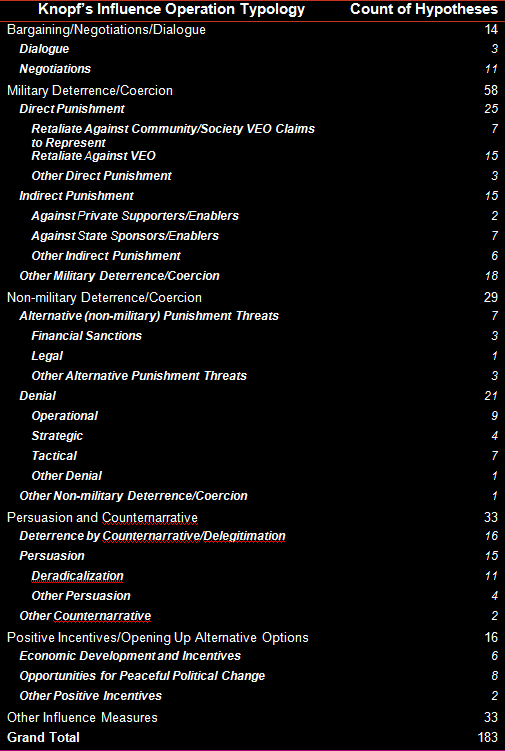 Fifty seven of the hypotheses had multiple qualitative and/or quantitative studies with contradictory conclusions (represented by empirical support scores 2 and 3). Since many of the hypotheses originated in other disciplines (besides traditional political science) and often in other contexts (such as interstate conflict or business strategy), each hypothesis was assigned an Applicability Score. The applicability is irresepective of the strength of support the hypothesis has received. (This scale is available by clicking the question mark next to Applicability Score in the Knowledge Matrix.) The empirical evidence in the majority of hypotheses was directly relevant to the context of VEOs. The default sorting of the matrix is a VEO influence typology developed by Jeffrey Knopf. The table below shows the breakdown of hypotheses in each facet of the typology. Influence operations can be intended to influence different groups of people: the organizations themselves, their leadership, their supporters, etc, which we refer to as ‘system levels’ in the VEO’s support network. 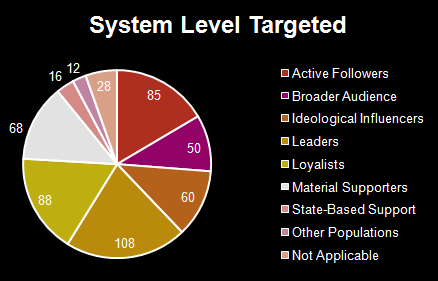 Many of the hypotheses targeted multiple system levels. The hypotheses are also categorized by type of influence strategy. 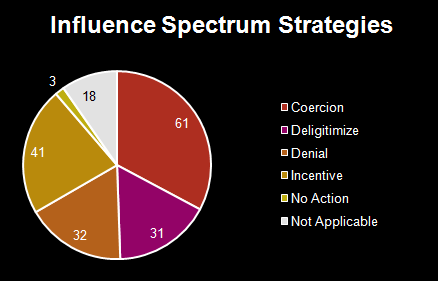 While hypotheses could be categorized by more than one Influence Spectrum Strategy, 61 hypotheses are classified as Coercive while only three of the hypotheses involved a No Action strategy. Finally, six particular hypotheses were the most supported by empirical research, while also directly applicable to the context of VEOs. Based on the relative confidence in these hypotheses they may be of particular interest. 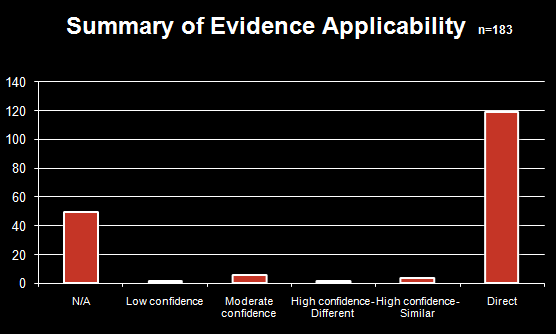 All of the hypotheses in the table received the highest level of empirical support that applies to the influence of VEOs. Note the numbers in parentheses are the hypothesis numbers, not a relative show of support for the hypothesis.